Top-down approach: The executive management, certain users with particular authorizations in specialist departments, or central editorial departments enter messages. Employees acknowledge them. Communication is cascaded from top to bottom. Bottom-up approach: Employees have the option to compose messages and other users can read them. News is not just communicated in one direction, but in both. This way, ideas get the chance to travel from the bottom to the top. One-sided or with a feedback channel? There exists intranet news that gets published and that users acknowledge. Other news asks for direct dialogues by enabling comments and feedback with an 'I like it' option. Like this, if desired, a central, transparent and productive exchange can take place within the context of the message. Should a message be visible for a longer duration so that as many users as possible can read it? Or should an internal message get distributed quickly and on an ad hoc basis, because it doesn't have such a long lifespan? News about an upcoming merger with another company is treated differently to announcements about internal events for employees. In a business context, a factual style can be appropriate. However, the people working in corporations still enjoy tools better when they are attractive: More pleasure with a system means a higher degree of utilization and consequently more benefit for the corporation. There are useful application scenarios for all mentioned approaches - and which format gets selected when depends on the company, the type and goal of the news, and the degree of employee-centeredness. Often it's a mix of different formats: Each company drives their own internal communication and news strategy. The Enterprise News Bundle for Confluence supports you to meet your specific requirements. Anyone who would like to publish attractive news in a magazine style, that supports various media formats and news types, can generate interest with multimedia supported messages. One particularly great feature: Cover Stories can be personalised to show targeted tiles. Instead of displaying one message for all users, broadcasts can be tailored to specific user groups, for example according to user profile attributes like location, department or language. Three different layouts are currently available for the display, more options will be added in future versions. Each element is populated individually with specific news-channels: In the top-left corner is news that is always relevant for the entire corporation, in the bottom-right corner is local news from the users' current login location, in German or English depending on the users' language settings - whichever way the communication concept specifies. The Corporate News Feed offers a neat News List for top-to-bottom communication. The user quickly gets an overview of all relevant news, saves time and is up-to-date with what is happening within the company. On the other hand, the internal editorial department has control over which messages are displayed and can steer information in a targeted manner: News Feeds can be displayed centrally (e.g. on Confluence intranet landing pages), but can also get integrated on any other Confluence page with macros. The Corporate News Feed offers the same options for personalization as Cover Stories. 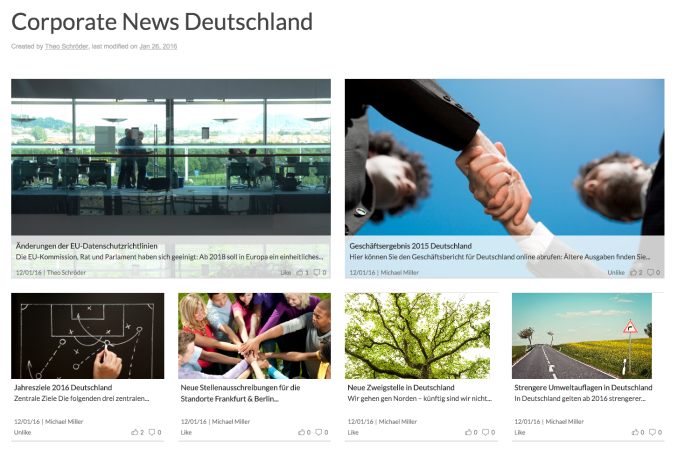 Many companies have various News Feeds on their intranet: specialist departments, employee representatives, human resources, management, and so forth. And rarely all organizational news is relevant for all employees. Thanks to the Personal News Feed feature, it is possible for users to establish their own individual Feed from the available News Resources. Consequently they only receive news that is relevant and interesting for them (next to the central news broadcasts). Our short video demonstrates how easily this can be done. This feature enables the broadcasting of news that all users are obliged to acknowledge. The user has to click on a confirmation (e.g. 'I have read this') in order for the message to disappear. This has two advantages: On the one hand, the communications department can ensure that no one overlooks an important message. On the other hand, users are certain they have read all critical information, even if they don't read the news regularly. Working with news is fully integrated in Confluence. There are no additional functions that require familiarization, instead all messages are configured with macros. The news content is created by the editor as native Confluence blog posts. On which channels the news is broadcast, makes no difference to editors. They create the message, build in a preview macro and each module displays the news as best as possible. The Enterprise News Bundle is an integral part of our Confluence-based intranet suite Linchpin and is also available as a add-on for Confluence at the Atlassian's marketplace. You can test the add-on free of charge and without obligation: Our documentation is a great starting point for this. If you have any questions or require support during implementation or configuration of operative applications, or want to license the product, please get in touch with us!